Re-creating staple comfort foods into healthier alternatives is a topic of much interest for me. Whilst my colleagues were talking on how they make the famous Mac and Cheese the other day, I immediately started thinking of how I could re-create the dish whilst replacing the flour, butter, pasta and cheese with other whole and less processed ingredients. It is not because this food is bad for me, but because in reality healthy food makes me feel better. I thought of replacing the flour with tapioca or arrowroot, this paleo flour is a brilliant alternative for creating starchy food. If you have missed my paleo naan bread recipe, check it out! I thought of using only half a cup of this flour, since it is a starch. I didn’t end up with a really creamy dish so you could double the amount of flour and milk if you want a denser outcome. In this case also allow around 20 minutes more cooking time. 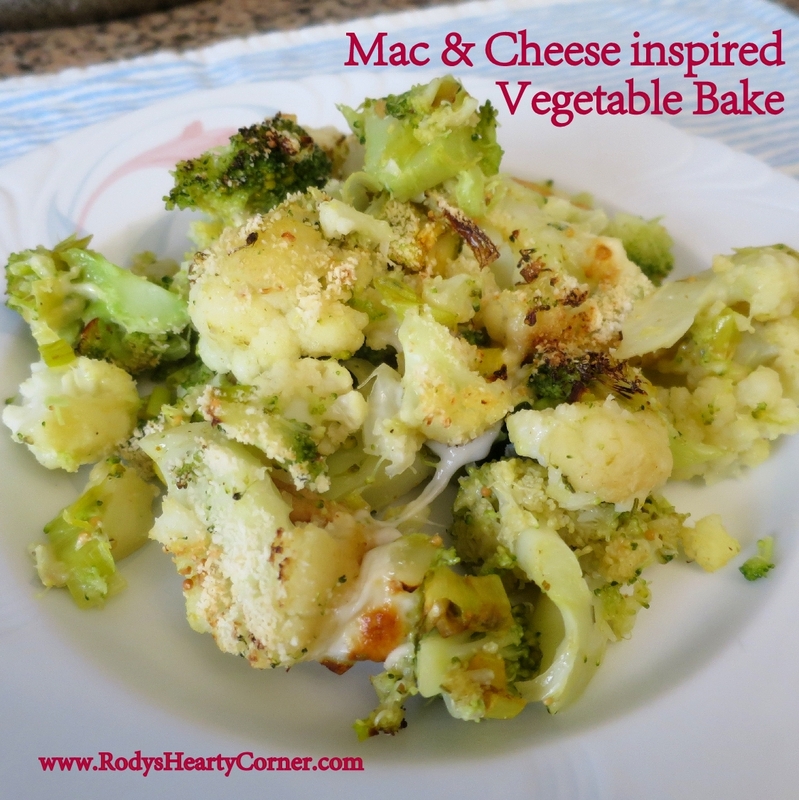 As for pasta replacement I immediately thought of cauliflower and broccoli since these are perfect baked. You could also use cauliflower on its own if you don’t want to see anything green on the plate, this will also look more like pasta. I still used some white cheese and went for a local cheeselet instead of the more processed cheese. This is white semi-hard cheese and could be replaced with goat cheese or other cheese of your choice. For a vegan meal, try making your own cashew cheese which would be brilliant for a creamy “Mac n Cheese”. At first I had the idea of simmering the tapioca and milk to create a béchamel like consistency, but then I thought of keeping with my recipe traditions to use less dishes, so I just mixed the ingredients together cold and then let them cook in the oven. I have also added some bacon for extra flavour but this can easily be omitted to create a vegan dish. Steam or lightly boil cauliflower and broccoli until al dente. You can do this on a covered saucepan over 1 cm water. It will take about 10 minutes to steam the veggies. Alternatively you can use steamer or microwave. In the meantime stir-fry the leeks with olive oil, garlic, spices and salt & pepper. When almost cooked add in bacon and cook for a further 5 minutes. Pour the tapioca flour and milk in a separate container and mix with an egg whisker so that no lumps are formed. 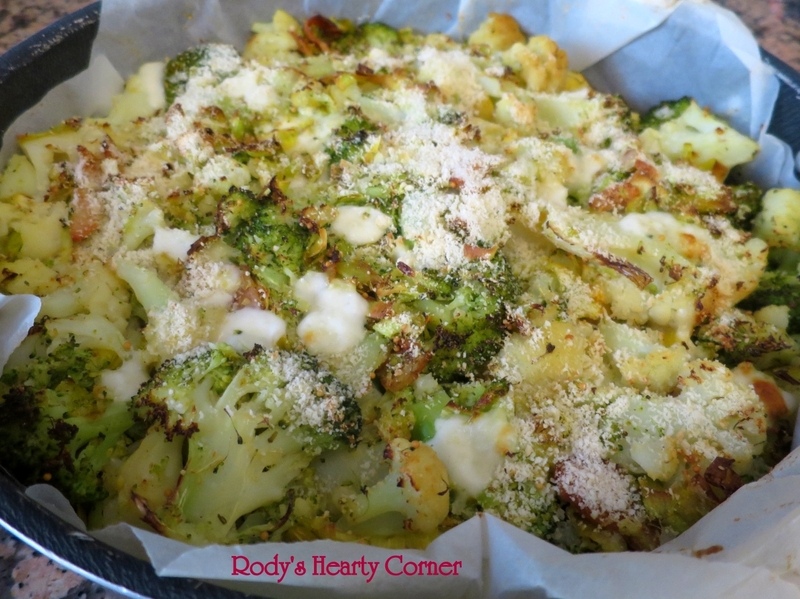 After cauliflower and broccoli have steamed gently break them up in a large bowl. Then add in the leek stir-fry and grated cheese, keeping some cheese for the top. Finally add in the flour mix and cover all vegetables. Line an oven proof dish with grease proof paper and pour in the vegetable mixture. Press vegetable mix at the bottom of the dish. Top with ground almonds and the remaining cheese. Cover the dish with foil and bake in pre-heated oven for 20 minutes. Remove cover and bake top for a further 10 minutes.